Here's how the scam works: upon installing and firing up the game, you're prompted to design your penguin avatar. Once you're ready, Pengu Cleans Up will ask you to confirm the design of your character. The first two windows are rather inconspicuous, but it's at the third one that the 'gotcha' happens - the last dialog is actually a Google Play subscription dialog that baits you into signing up for a weekly fee. The first two dialogs are cleverly designed to mimic the looks of the third one, which could easily fool many distracted or inattentive users into tapping "Confirm" without carefully inspecting the last dialog and noticing the subtle but important differences. Kids are especially prone to this scam. Luckily, it didn't take long for the scam to be noticed by eagle-eyed users who flooded the game with negative reviews, but not before the game scored between 50,000 and 100,000 downloads. 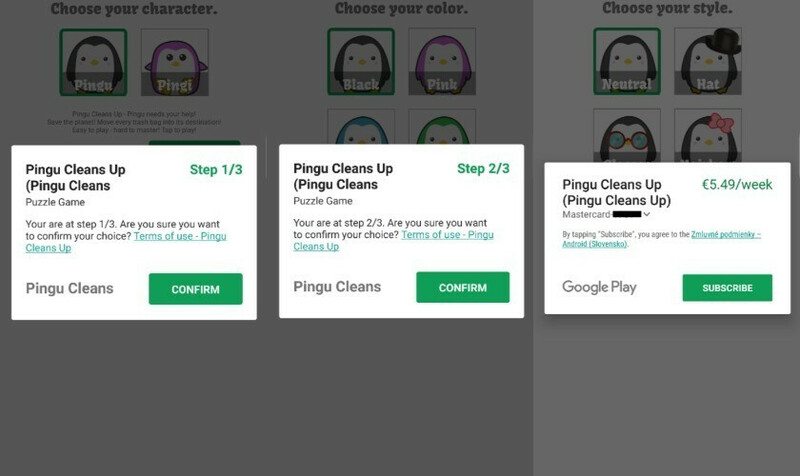 Pingu Cleans Up has been subsequently removed from the Play Store, but this doesn't mean that the scheme can't be employed by another wrongdoing app in the future. Beware. Shouldn't you be able to cancel subscriptions like you do any other subscription in Google Play? That's what I meant, canceling it via Google Play like any other subscription. This isn't a security issue, genius. Also, if anyone even bothered to read the prompts, they would have realized they were going to be charged. I feel zero sympathy for these people. Actually this is a security issue. Denying it doesn't eliminate it. If you look at the definition of security: Security is freedom from, or resilience against, potential harm (or other unwanted coercive change) from external forces. Then this is most definitely a security issue. But it's not like your device is hacked or breached. Still, it is a security issue. You don’t have to be a genius to know this isn’t a security issue, but a scam targeted towards unsuspecting kids. Since Google uses an automated acceptance test for apps and Apple does it manually, they can never be equally secure. And while this one can be avoided by users by just reading, it is Google's job to make sure no trickery enters the Play store. Not sure there's much testing going on at Apple these days. My studio had an issue where a scammy developer used fake screenshots for their game on the AppStore and listed our website as the support link. I had to spend a good week replying to pissed off people who were scammed into paying for the game. It took solid two months before Apple fixed this, even though the guy had several such fakes listed and used ridiculous support links on each one (such as facebook.com). Here comes the fandroids defending google play store. Saying "App store also has a lot of junk apps like in the playstore! And they all come with microtransactions!" App store also has a lot of junk apps like in the playstore! And they all come with microtransactions! There...feel better now? That's what you wanted right?? @lyndon420 LOL! Why copy my comments when you can create your own? Google should make purchase dialog buttons a different color. Maybe red mandatory. People should read what's on their screens, it shouldn't be that difficult.